This year I participated in 10 challenges and I only completed two but I had a good time making lists, meeting new blog friends and so I say that’s a success. Now it’s time to wrap up one and tell you about a new one. I didn’t finish the Everything Austen challenge but wow, did I read and see some great stuff. I read Persuasion which I absolutely loved and enjoyed the film. Another book I read and didn’t get to review was Confessions of a Jane Austen Addict which was quite enjoyable. My mom and I watched Emma which was so fun and I finally watched Pride & Prejudice completely. I had seen bits and pieces but finally I got to see it and just loved it. I want to send a big thank you to Stephanie for hosting this one. Now, I’m very excited to join in the Graphic Novels Challenge hosted by Nymeth and Chris. I really enjoy graphic novels and unfortunately this year I didn’t read as many but hopefully that will change next year. I’m going to try and shoot for the intermediate level, which requires reading 3-10 novels. The Freddie Stories by Lynda Barry. I just love Barry’s storytelling which I’ve found so vulnerable and raw. The Impostor’s Daughter by Laurie Sandell. I’ve noticed that some of my favorite graphic novels tend to be memoirs so I’m looking forward to this one. Back Hole by Charles Burns. This is one I’ve heard about a lot from several blog friends so it’s been on my radar for a while. Other authors who I’d love to read some books by include Rick Geary, Gilbert Hernandez, Art Spiegelman, Harvey Pekar and many more. How about you, how are you doing with your challenges and how many are you joining next year? Pride and Prejudice is such a good book–and movie. 🙂 I hope to read Imposter’s Daughter this next year. I’m only going to be doing 2 challenges this next year, one is a continuing one from this year and the other is part two of a bigger challenge. I didn’t do so well this year with challenges (or last year for that matter), and so decided a break was in order. Yeah, well, we aren’t being paid to finish these challenges, so what the hey! I am in on the GN Challenge too! I’m expanding my horizons, as I’ve never read one in my life! Sandy – You haven’t? What is wrong with you? haha… I’m so glad you are joining. I can’t wait to see your list! It is not about completing, it is about the journey the books take you on. That’s my motto anyway. Even though you didn’t finish some of the challenges, you got to read some fantastic books. I am really looking forward to the graphic one too, as it really is a new genre for me. I didn’t finish the Austen challenge either. I read: The other Mr. Darcy, The Confession of Fitzwilliam Darcy, and The Plight of the Darcy Brothers. I think I overloaded on P&P. There aren’t enough days left in the year to read all the books I want to. Wow, I think you did very well. As long as you had fun…that’s all that matters. I’m hoping to finish the Everything Austen challenge by finishing up the book I’m reading now (Mansfield Park Revisited) and watching the Keira Knightley version of P&P, which I haven’t seen yet. I have a couple days left, so keep your fingers crossed. I haven’t participated in too many challenges since launching War Through the Generations. I think I’ll focus on the Vietnam challenge and maybe join Everything Austen if Stephanie decides to host it again. I think I finished one challenge this year and actually only officially signed up for 4. I haven’t seen a challenge that has grabbed my interest yet – what I need is another of those read your own books challenges so I will be on the look out for one. I was pretty mucy where you were with the challenges. I’m glad I don’t stand alone. LOL I did read some new Austen material for my challenge, so that was good. I also saw the movie, twice in fact. Congratulations on your participation and a new year!!! Welcome to the Graphic Novels challenge! I look forward to your thoughts on the books you read. I really loved Black Holes, but didn’t have much luck with The Impostor’s Daughter. And I’ve been meaning to read Lynda Barry ever since I first heard of her, which I think was through you! I never complete all my challenges, but like you I find it fun just to make lists and see what other people are reading, and challenges also inspire me to pick up books I may not have otherwise. I’ve gone a bit overboard with challenges for 2010, but oh well, I have so much fun signing up! Just wanted to add a recommendation – Alice Munro’s Too Much Happiness. A series of short stories by this Canadian author. Also available on CD. I appreciate her writing so much I find myself checking the library to see if anything new has come out lately. I should probably own up to the challenges I participated in, but I don’t think I finished a single one! I would like to read a few graphic novels next year, so I will have to check out the books you read. Happy reading in 2010! Good luck with the graphic novels challenge! I’ll be joining in on that one yet again, and I’m especially excited you’re thinking of reading Black Hole. I read it several years ago and I loved it in all its weirdness. vivienne – I love your motto and I think I’m going to borrow that too 🙂 I hope you have a fun time discovering the world of graphic novels. I really enjoy them. Serena – thank you! I think I did pretty well too and of course best of all was that I had a lot of fun. Anna – Oh keeping my fingers crossed for you! I hope you finish your challenge. I’m so tempted by the War through the Generations challenge. I wish I hadn’t missed the last one. Still thinking of joining! Stephanie – Thank you again for hosting. My mom had a blast watching the Austen adaptations with me. I think she’s watched all videos several more times so she’s a real fan! Juliann – I bet someone has a challenge like that out! I do try to pick book from my stacks for the challenges so I figure that’s another way that helps me get through my stacks. Wisteria – Yea, I sign up for so many and I think a big part of the fun is just coming up with my book lists. 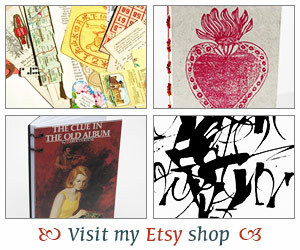 I love to look through my book piles and choose books. Wishing you a great reading year too! Nymeth – I have heard some mixed reviews on the Impostor’s Daughter so I’m trying not to get too excited and I really hope you’ll read Lynda Barry one of these days. There is just something about her books that is really touching. Thanks again to you & Chris for hosting the challenge! Melanie – Well, we have good intentions right? 🙂 Have fun signing up for all of your challenges and making up your lists. I need to see which challenges you are participating in. peggyvan – Oh I finally discovered Munro’s short stories a couple of years ago and really enjoyed the couple that I read. I must read read more. Thank you for the book rec! Danielle – I was doing so well with my challenges until about mid-year I just sort of lost track of all of them. So are you not joining any next year? Hope you get to read some graphic novels though! Andi – Ha,ha.. Glad to hear I’m not the only one 🙂 I’m glad you are doing the graphic novels challenge too! I am sure you were one of the ones who got me interested in reading Black Hole. I love weird stories every once in a while and this one sounds like it’ll fit the bill! Just joining the challenges is the fun part, you know… I enjoy that anyways! Here it is not even 2010 yet, and I’m worried I’ve over committed myself already! One of the things I’m really looking forward to is Read Alongs: I’ve done none yet in any of my three years of blogging. This year I’ve signed up for three: The Woman in White, The Time Quartet and Woolf in Winter. Fun! I just reviewed a graphic novel for The Children’s Book Blog Tour, which will be posted in a week or so. I must admit, I don’t see the compelling part of graphic novels. But, I’ll hang around all of you who do, and see if I can’t come to appreciate them more. I’m not joining any challenges this year. They seem to bring out my rebellious nature. The minute I have certain books that I know I have to read, I don’t want to. I’ll enjoy all of the book ideas I get from all of you participating in challenges and I will definitely finish Fun Home (my first graphic novel) and will read others this year as well! Bellezza – I just spent most of the evening making lists for more challenges so I can totally relate! Have fun with the read alongs! And, I’ll be looking forward to your review of the graphic novel. I do think it may take a while to really take to them. Now, I did try a manga this year and I didn’t like it. The whole way you are supposed to read it was a bit hard for me. Kathleen – You are very good! And, I do know what you mean about wanting to rebel. I even change my book lists throughout the year and I still can’t finish challenges. Haha… Looking forward to what you think of Fun Home. I thought it was good. My reading is so much based on my mood that I don’t know if I would ever be able to finish a challenge. I guess that is why I shy away from them so much. I love the Austen challenge you did. Now, I might be able to do that one. I loved the film version of P&P as well. You must see Lost in Austen – something that you can not rent through Netflix etc. 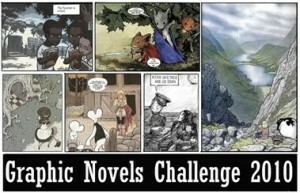 The graphic novels challenge sounds good – will be interested to hear about the books your discover….